Wednesday 3rd April – Australian Market Wrap | Beeks Downunder-Because not all financial news is boring! ASX 200 kicks another 43 points to 6285 in post Budget euphoria. US futures slip slightly down 22. Once again miners lead the way, led by BHP up 2.25% and FMG up 1.8% on rocketing iron ore price in Asia with another cyclone brewing for next week potentially. Now $125 in AUD. Healthcare a winner from Budget with SHL up 1.35%. Utilities firm as TCL up 1.3% and SYD up 1.5%. Even TLS rose 1.2%. Banks remain mixed and muted with NAB down 0.2% and WBC up 0.1%. MQG up 1% to all -time highs. Industrials firm with COL doing well up 1% and BXB up 1.3%. AUD around 71c. Plentyof economic news out today excluding Budget. ASX 200 up another 43 points to 6285. Iron ore up another 4% in Asia. Miners the star performers as iron ore continues higher in Asian trade. Banks mixed with healthcare stocks firmer. Industrials see some buyers but retailers slip on sale numbers. Bitcoin (you remember this one) huge run up 20% in a night to $5051. Asian markets strong with Japan up by 0.53% and China puts on another 1.05% on positive PMI data. DHG +8.18%. Strategic review in background. JIN +6.03% another jackpot day. Getting toppy. PME +7.77% winner from Budget perhaps. AMP +2.76% Harris Associates ceases to be a substantial shareholder. SIQ -8.28% big change in director’s interest. HVN -3.14% bull run runs into profit taking. Z1P +2.14% BNPL stocks doing well. SPT +10.16% feeling the BNPL love. NUF +2.49% signs of life. ANO +10.86% keeps pushing higher. MYO +1.20% Manikay caves and says yes reluctantly. Speculative Stock of the Day: Digital X (DCC) +26.32% big rise in Crypto currencies helping as ASX quersies price rise. Bitcoin runs over 20% in a night. Sure helps. ASX Group (ASX) +1.32% Monthly activity report for March. Total capital raised was $5.3billion, down 8% on year. The average daily number of trades was up 27% on year. The average daily value traded on-market of $5.0 billion was up 14% on year. Volatility (as measured by the average daily movement in the All Ordinaries Index) was 0.3% in March, down on the previous month 0.4%. Eclipx Group (ECX) –2.53% ECX and McMillan Shakespeare (MMS) agree to terminate SIA with immediate effect. ECX to pay MMS $8m for costs that it incurred in connection with the proposed takeover. A2Milk (A2M) +0.43% The company has guided that higher dairy prices will not significantly impact gross margins in FY19 but may harm FY20 numbers. Appen (APX)+3.68% Completes its acquisition of Figure Eight Technologies. Freedom Foods (FNP) +2.35% Expects sales of Lactoferrin (protein found in both cow & human milk) to start late in 4th quarter. Expects to deliver a material earnings contribution in FY20. Retail Food Group (RFG) +4.35% Has reported that negotiations with a potential buyer of Donut King and QSR holdings have ended. An agreement couldn’t be reached. RFG continues to explore options to reduce its debt, including the potential sale of assets. CBA Australia PMI Services (Final): +0.6 points to 49.3 points. Retail trade rose 0.8% in February, well above forecasts of 0.3%. 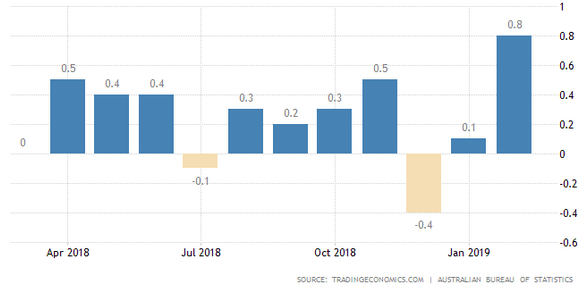 From the ABS: The trend estimate for Household goods retailing fell 0.2% in February 2019. The seasonally adjusted estimate rose 1.1%. By industry subgroup, the trend estimate fell for Furniture, floor coverings, houseware and textile goods retailing (-1.1%), and Electrical and electronic goods retailing (-0.2%), and rose for Hardware, building and garden supplies retailing (0.6%). The seasonally adjusted estimate rose for Electrical and electronic goods retailing (1.2%), Furniture, floor coverings, houseware and textile goods retailing (1.5%), and Hardware, building and garden supplies retailing (0.7%). 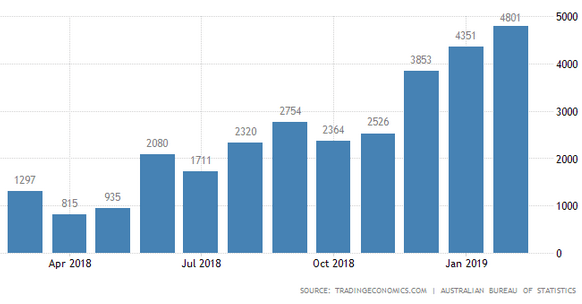 Biggest trade surplus on record. 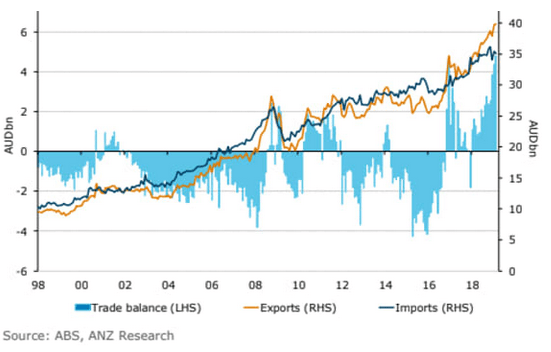 Trade surplus rose from $4.6bn to $4.8bn in February, ahead of expectations of $3.7bn. 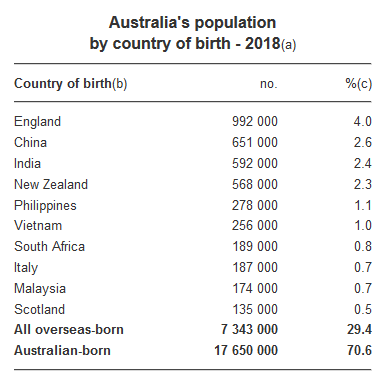 There were over 7 million migrants living in Australia in 2018. England remains top as more exit on Brexit. In the year to 30 June 2018, 526,000 people arrived to live in Australia, while 289,000 people left Australia to live overseas. 62% were temporary visa holders and 30% were students. No wonder we have overcrowded cities. The Australian Office of Financial Management (AOFM), which issues government bonds, says it will issue a total of $54bn in this current financial year. For 2019-20 this will increase to $58bn. China’s services sector accelerated to a 14-month high in March. 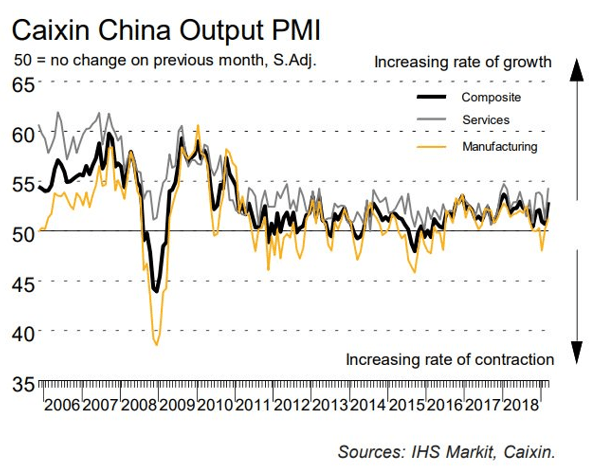 The IHS-Markit China Services Purchasing Managers Index (PMI) jumped to 54.4 in March in seasonally adjusted terms, lifting strongly from 51.1 in February. Japan’s services sector held firm in March. Optimism that the US and China are close to an agreement. UK PM May may have a solution to the Brexit impasse by talking to Labour. EU draws up strict conditions for any Brexit extension. Softer Brexit beckons perhaps. Chicago has elected an openly lesbian black mayor. First time for any US city. Rolls Royce has some more problems as Singapore Airlines grounds planes. And finally……………Clarence is heading off to the South Coast tomorrow for a few days ..back soon. Traffic update: A truck full of marmalade has overturned on the Harbour Bridge. The traffic is pretty jammed. My mate George and his missus wife are on the verge of splitting up because of his obsession with rugby. However, the good news is that they have decided to give it one last try. My friend said he didn’t understand cloning. I told him that makes two of us.